Lock in a great price for Comfort Inn Bushman's – rated 8.6 by recent guests! The owner &staff were great. Excellent meals. The rooms were spacious & the bed was comfortable. Clean modern, staff couldn't have been more friendly and helpful. 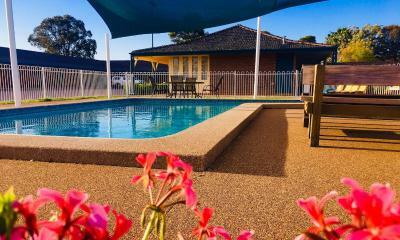 Close to town garden so nice walk in the morning- I've found my place to stay in Parkes. Big spacious rooms for a family of four. Very clean and comfortable. Lovely clean and the pool was amazing and so welcome! I liked the fact we were arriving late so the staff called us to let us know exactly how to enter the room. The room and bathroom were very nice for a motel. Very spacious, and nice quality fittings. Ace was very helpful at check-in. Nice comfortable establishment with friendly staff. Room nice and cool when we arrived. 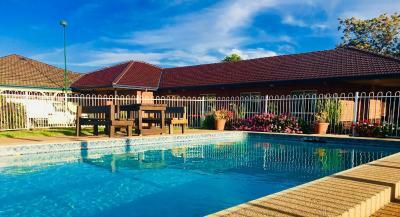 Comfort Inn Bushman's This rating is a reflection of how the property compares to the industry standard when it comes to price, facilities and services available. It's based on a self-evaluation by the property. Use this rating to help choose your stay! Featuring an outdoor saltwater pool, Comfort Inn Bushman’s offers 4-star accommodations with a flat-screen satellite TV and DVD player. Guests enjoy an on-site restaurant and lounge bar. The restaurant offers a diverse a-la-carte menu and is open Monday - Saturday for dinner and and Monday - Friday for breakfast. All rooms provide air conditioning and include a mini-bar and tea/coffee making facilities. Some feature a spa bath or a private balcony. 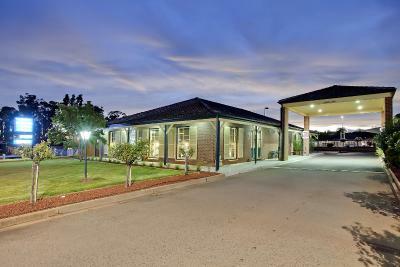 Bushman’s Motor Inn is 5 minutes’ drive from Parkes Railway Station. Griffith Showgrounds are 4 minutes’ drive and Parkes Golf Course is 10 minutes’ drive away. When would you like to stay at Comfort Inn Bushman's? This spacious air-conditioned room features a private balcony and a corner spa bath. It includes a 51-inch flat-screen satellite TV, a mini-bar and tea/coffee making facilities. 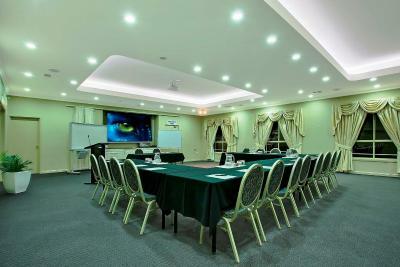 This air-conditioned room features a flat-screen satellite TV and a DVD player. There is a separate dining area and kitchen facilities include a microwave, toaster and tea/coffee making facilities. This room features wheelchair access and a patio with outdoor seating. There is a flat-screen satellite TV, DVD player and mini-bar. Kitchen facilities include a microwave, toaster and tea/coffee making facilities. 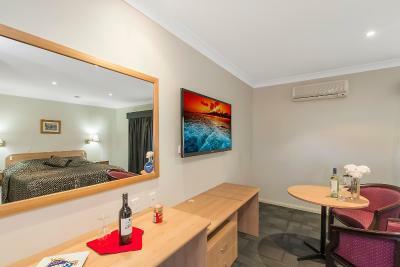 This room with wheelchair access features a flat-screen satellite TV, DVD player and mini-bar. Kitchen facilities include a microwave, toaster and tea/coffee making facilities. This spacious air-conditioned room features a private balcony. It includes a 51-inch flat-screen satellite TV, a mini-bar and tea/coffee making facilities. This air-conditioned room features a flat-screen satellite TV, DVD player and mini-bar. Kitchen facilities include a microwave, toaster and tea/coffee making facilities. Quiet and comfortable. Modern refurbished rooms. Ample parking on site. We have a free guest laundry. Free WIFI available. 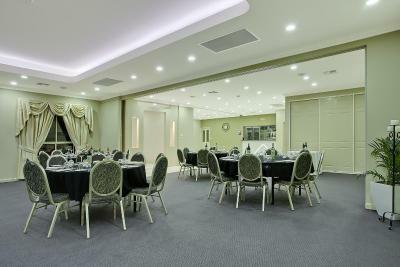 Onsite Restaurant and Conference Centre. House Rules Comfort Inn Bushman's takes special requests – add in the next step! One older child or adult is charged AUD 10 per person per night in a crib. Comfort Inn Bushman&#39;s accepts these cards and reserves the right to temporarily hold an amount prior to arrival. Comfort Inn Bushman's accepts these cards and reserves the right to temporarily hold an amount prior to arrival. If you expect to arrive outside reception opening hours, please inform Comfort Inn Bushman's in advance, using the contact details found on the booking confirmation. Great facilities and awesome staff. The mini bar man tried to enter my room whilst I was in the bathroom at 8am in the morning on the day of my checkout. When I mentioned this upon checkout, the staff member said he knocked 3 times. I didnt hear him as I had the hair dryer on...he tried to get in anyway, Im so glad I had the chain on my door. Then I was told that I shouldve had the 'do not disturb' sign on my room if I didnt want staff to enter. Very creepy. Staff at restaurant did not seem to know much about the Elvis festival and what was on in the area at the time. Only able to promote the satellite dish. Would benefit from a bit of knowledge to help tourists. Rooms were dirty and smelt bad. The cleanliness. Overall it was okay, however the bathroom was not cleaned properly every day, and they did not change the towels. I put them on the floor, expecting them to be changed. They just picked them up and put them on the vanity, didn't even hang them up! Taps and shower wasn't cleaned either. It was very quiet - we did not hear any of the neighbours. Shower was a bit hard to adjust! 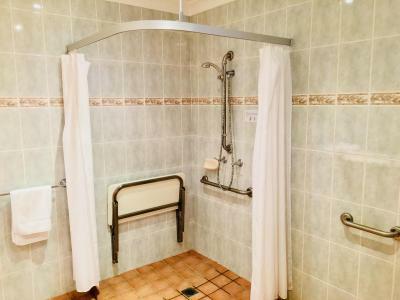 Good size room, good size vanity in bathroom, good size shower. Clean and comfortable, helpful staff and a nice meal. The pillows were very hard. Not close to the centre of town (first motel on the road in from the north) Traffic noise in rooms close to main road. Trucks changing gear on the hill leaving town are noisy. Double glazing helps but you cannot open window for fresh air. Caters for cigarette smokers. Ashtrays outside room full of butts. Restaurant looked good. Pool well maintained.